The first time I say this poster, Burs and I were walking out of the cinema after seeing Looper and there across the wall was a poster for Tarantino’s new film. I hadn’t heard anything about it. And that was the first time I’d seen the poster. 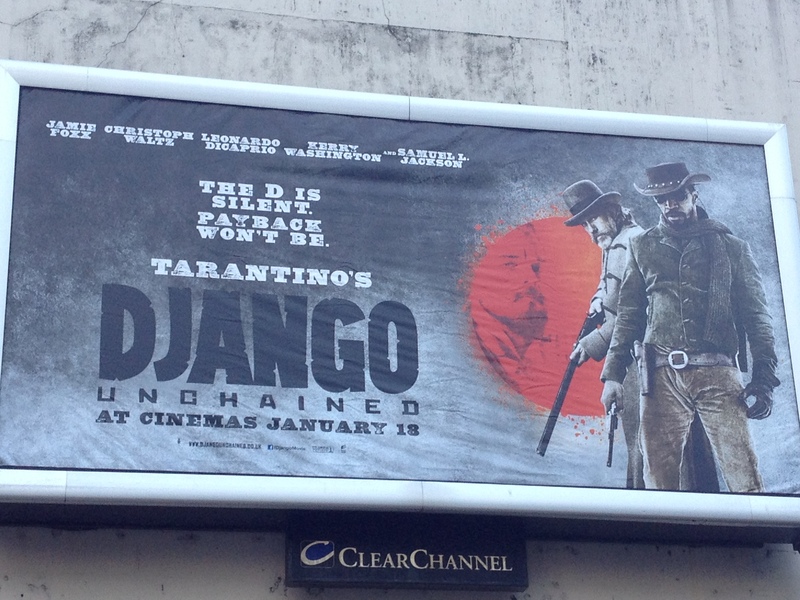 But seeing as how I’ve seen every Tarantino movie, I immediately got excited to see this one. Even though it looks like a western. And I hate westerns. But it’s a Tarantino film and I have to see it. I penciled in January 18th in my mental diary and began looking forward to the date. Then the reviews and comments about the movie began to enter my stream and I finally found out what the subject of the films was – Slavery. I began to read reviews about another movie about slavery being made. I was sent comments cursing out Tarantino for even attempting to tell the story of a black slave. I read op-ed pieces about the experience of being a black man watching the movie in a room of white people. I read a diatribe from a white reporter belittling black people sensitivities to movie and its subject matter. A lot of people had a great deal to say on the subject. And yet, in the UK, it’s hard to find any information on this movie. At all. Ask someone about it and they, like me, are just excited that there’s a new Tarantino flick. Being black and from America, I’ve had a few conversations with people about it and the over- whelming sentiment is that they’re all – white or black – amazed at how fresh the slavery wound still seems to be for Americans. Which leads me to explaining, not for the first time in my lifetime, that the history of American slavery isn’t my history*. And that though I’m amazed at how fresh the wound is for some, I can understand it. After all, the oldest American died only two weeks ago but I believe that she was born in 1898 and though slavery was suppose to be abolished in 1865, there are some records that claim it should be written as 1928 instead (because people don’t change their ways too quickly). There are people my age who listened to stories being told by their grandparents which helped keep the wounds fresh, even after all these years. All that to say how incredibly refreshing it is to not be in New York having heated discussions about the weight of the film on society today. How amazing to have be just a film. A film telling a story of years gone by. A film using flourishes to make an interesting and visually captivating story. Because, nearly everyone I’ve spoken to in London, sees it as just that. Slavery, on their home turf, isn’t their history either (of course, Burs does note that, Britons did partake in slavery but only on other peoples soil, never their own. Which doesn’t make them better, just a wee bit smarter). So I’m going to see it. Most likely in a theater where I’ll be one of maybe five black people in there, sitting beside my Scottish (read: very white) husband. And I will enjoy Tarantino’s cinematic genius for what it is. *My family and several generations back from that stem from Haiti. Which became a free country from French rule in 1806. And yes, the generations before them probably were brought to the island of Haiti via slave ships but there’s only so many generations I can keep count of, so anything that happened before either of my grandmothers, I don’t count as my own. And since both of the matriarchs, on either side, were born in the early 1900s on the island of Haiti, that is where my story begins. I had mentally begun to prepare myself for what was going to happen on Thursday, days ahead. It wasn’t anything specific, it was simply an eye test for the lil one. Nearly anyone who grew up in a two family household may follow a simply sharing of duties: the ladies of the house handle all things about your over all well-being (doctors, dentist), as well as exterior (how you look), internal (what you eat) and formatted education (school, parent teacher meetings, piano lessons). The male figures in the household handle fun stuff (camping, backpacking), life survival stuff (changing flat tire, oil changes, creating fire with sticks) and extra-curricular activities of a sporting nature. So by me making lil Burs’ optometrist appointment, I’m simple playing my part. However, there’s this thing that happens or rather, things I’ve experienced, when I’ve had her on my own and done these activities before. It’s the inquisitive stare down. The look people give you while they try to figure out our relationship. Which is funny because in New York, people would have automatically assumed I was the nanny. But here, they aren’t quite sure. So instead, they look at us or rather me, wide-eyed and speculative. Am I the nanny or the mommy or have I just kidnapped her and am forcing her to do these random everyday activities in the hopes of passing her off as my own?!? For a while I thought I may be imagining all this. Because I am a New Yorker and in tune to the thought process there when people see a black woman with a younger white child. It’s nanny first and foremost. There’s a famous soap actress who adopted a caucasian girl and I remember an interview where she remarked on how it hurt her most because everyone assumed she was the caretaker. I also, had a friend, who’s wife was bi-racial (black & white) and he was green eyes, blond hair; their child came out a reflection of him. Which troubled his wife because no one thought that she was her own daughters mother. Who wants to go through hours of labor to always be thought of as the help? Where there’s a concierge desk. There are four people who man the desk round the clock. Two of which are lively fellows; chatty and funny. Always full of conversation. They are also both black. They greet me everyday with big smiles and a ‘Hello Sistah’ or a ‘Goodnight Sistah’. They choose to save the bantering for Burs. So one day, one of them pulled Burs aside with a ‘Can I ask you a question sir?’ And began to politely ask Burs of our situation. It seems he (and I figure the other door watchers) needed clarity on what our arraignment was; that lil Burs – all fair skinned, blue-eyes and dirty blonde hair – was obviously his kid with another woman. And that I was his partner and not the nanny. Since then, I’m more aware of it. Thanks to my paranoia about it I need to prepare before taking her to any of these appointments. I don’t want to be the person who jumps the gun and starts off by introducing myself as her non-biological mother. And I’ve ruled out walking around with all my degrees attached to me (because seriously, what the hell do they mean in these times). Until, yesterday, it dawned on me how uncomfortable it is for the people on the other side of it. The guy that was at the appointment desk in Spec Savers, also, didn’t know how to address me. He knew we had the same address but different names. Lil Burs refers to me by my first name. I could see he looked flummoxed but didn’t know how to ask. I broke the tension and used the cursed stepmom, to wit he nodded and was able to move along. He honestly audibly exhaled. When he lead us into the examination room, he made a point of saying ‘this lil Burs and her stepmom’ so all parties involved were clear. The rest of the appointment went without a hitch. Which leads me to wonder, how can all this be handled better? A name change of course. I realize that in a few months time, once married, and I go through the horrible process of legally changing me name, they’ll be no more question. They’ll see the names and simply know. But then, of course, they’ll probably wonder how I bore a child with fair skin, blue-eyes and dirty blond hair…at my age.